Last weekend saw the restart of the touring team season at the Marsa Sports Club. 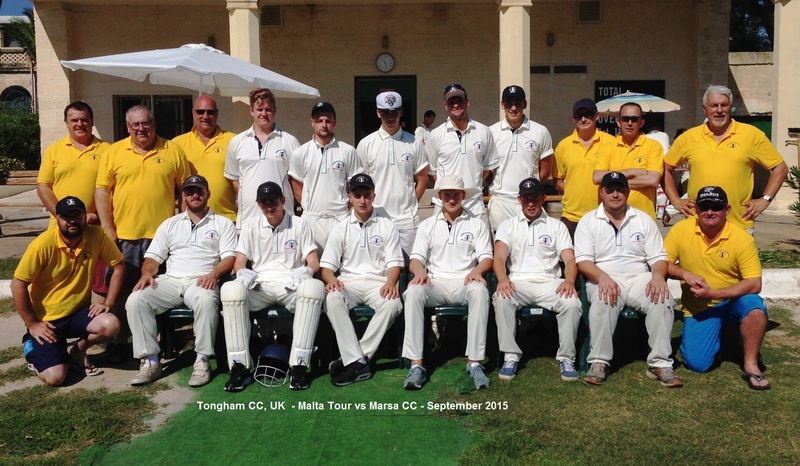 It was a successful weekend for first time visitors Tongham Cricket Club (UK) but there were also some memorable individual performances for the Marsa team which made for an interesting series. On Saturday, Tongham CC won the toss and elected to field first. The Marsa openers M.Sacco (14) and M Crabbe (3) fell early. H.Majeed (23) delighted his teammates by hitting four 4’s and a six in only 11 balls before he was caught well by M.Carrington off L.Gadd on the boundary. S.Anand made 11 runs before being bowled by the spinner S.Carrington. 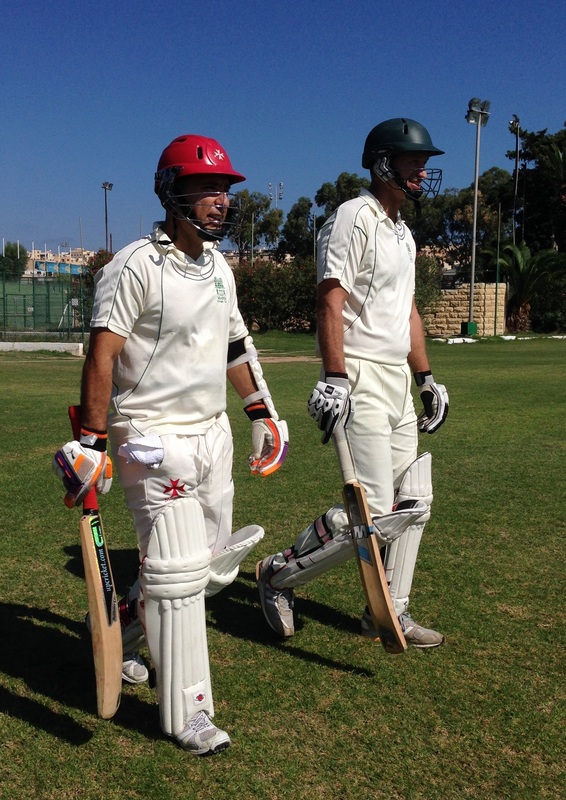 J.Grima (14) and B Arora consolidated the Marsa innings when it was needed, putting on 97 runs in the next 20 overs. Arora went on to score 105 runs, hitting nine 6’s and seven 4’s. It was his first century for Marsa CC. Sam Caruana finished the Marsa innings with 9 runs not out. Marsa’s final score was 212 for 8, with the bowling honours for Tongham going to S.Carrington with 3 wickets for 30 runs. After the lunch break, Tongham CC started their run chase with openers A. Farrier (54) and Jordan Frost (32). Both men took advantage of a Marsa bowling attack which lacked pace and precision and put on a 79 run partnership in the first 15 overs. Eventually Frost sent a catch back to bowler S.Anand and M.Carrington (14) hit a high catch to Majeed off S.Ali to put the score at 103 for 2. Tongham CC maintained a good run rate throughout and Marsa failed to make late inroads. James Frost scored 20, B.Turnbull 14, while S.Carrington and L.Gadd both scored 25 runs not out. It was a convincing win for Tongham CC with 5 overs to spare. Marsa won the toss and elected to bat in Sunday’s 30 over match, losing openers S.Aquilina and T.Wheeler within 5 overs. T.Azzopardi (43), K.Lobban (23) and R.Sacco (47) revived the Marsa innings with some sensible middle order batting, but even a spirited 16 runs from Feroz Ahmed could only take Marsa to 154 all out in the 29th over. The locals lost 6 wickets for only 12 runs in the last 4 overs. For Tongham CC, S.Reynolds took 3 wickets for 25, while D.Walsh and D.Hullock took 2 wickets apiece. In reply, the Tongham top order found it difficult against the opening bowling pair of K.Keyan and D.Arnold and scored only 33 runs for 2 wickets off the first 10 overs. R.Sacco’s 2 wickets for 23 was the highlight for Marsa but the end his bowling spell saw the floodgates open with S.Reynolds (51 not out) and D.Walsh (45 not out) seeing Tongham through to another easy victory with overs to spare. Marsa CC 212 for 8 (B Arora 105, H Majeed 23; S Carrington 3-30) lost to Tongham CC 213 for 5 off 35 overs (A Farriar 54, J Frost 32; H Majeed 1-23) by 5 wickets. Marsa CC 154 all out (R Sacco 47, T Azzopardi 43); S Reynolds 3-25) lost to Tongham CC 155 for 4 off 25.5 overs (S Reynolds 51, D Walsh 45; R Sacco 2-23, K Keyan 2-26) by 6 wickets. This weekend sees Marsa host Leo CC and Mawdesley CC from the UK with matches at the Marsa Sports Club on Friday (3pm) and Saturday, Sunday and Monday (11am).